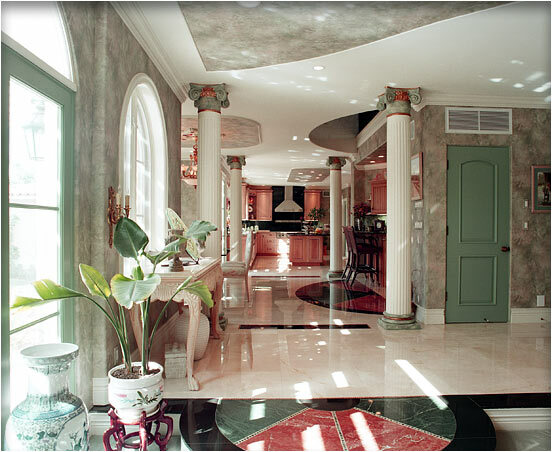 Larger Project 6-5, Columns » Roger Perron Inc. This view is the opposite of photo #3. The columns are Ionic style in concert and hand-painted. The several ceiling patterns are dropped with ¾″ plywood and drywall, and they were prepared in the rough frame; moldings wrap the drop section and faux wallpaper adorns the face. Notice the kitchen beyond. From the opposite view of photo #3 to the kitchen is a total of 67 feet of wide open space; this represents the whole rear of the home remodel and additions.